Ogden, Utah (February 19, 2016) — Ogden is set to welcome dual national championships to Powder Mountain and Snowbasin Resort February 27-28. 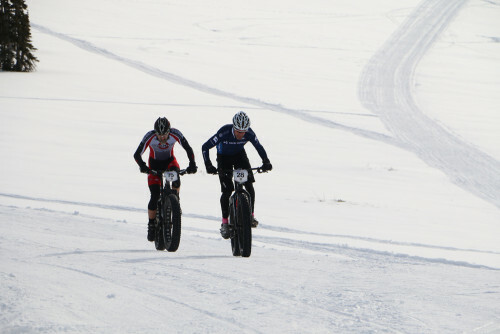 The second annual USA Cycling Fat Bike National Championships will return to Powder Mountain on February 27 and for the first time, the US Snowshoe National Championships will make their way to Powder Mountain and Snowbasin Resort February 27-28. Fat bikes have a “go-anywhere” capacity and are capable of extreme all-terrain conquests through the harshest elements all year. During the championships, amateur athletes will compete on a 12-mile course across Powder Mountain’s Hidden Lake terrain while pro and open class riders will endure over 18-miles of challenging terrain. Spectators can also experience the rush of riding a fat bike through free bike demos provided by Borealis and local bike shops. Spectators will also have an opportunity from Rockstar to win a fat bike of their own during the event. Additionally, there will be a consumer expo on Saturday at the race. The US National Snowshoe Championships will be held in conjunction with the USA Cycling Fat Bike National Championships on February 27-28 at Powder Mountain and Snowbasin Resort. Junior athletes will compete on a 5km course while those 20+ will race on a 10km course at Powder Mountain on February 27. A citizens 5k race will also take place on Saturday. Racers of all ages can register as late as the day of the event. On February 28 a half and full marathon and 10km team relay for qualifying athletes will take place at Snowbasin Resort. Registration for both events will be held at the Courtyard Marriott in conjunction with a Snow Sports Expo on Friday, February 26 from noon-6 p.m. The Expo is free and open to the public, vendors include Borealis, Scott, Yukon Charlie’s, Bar Mitts, Altra, Salomon and more. Additionally, the first annual Wasatch Yeti Bash presented by America First Credit Union will be held at the Ogden City Amphitheater on February 26. The Wasatch Yeti Bash will take place from 4-7 p.m. and includes a Winter Arts Market by Nurture the Creative Mind, a Community Bike Ride, Fat Bike Demo’s, Yeti Yoga, Yeti Sightings, Live Entertainment, S’mores, and costumed fun for all ages.